WARNING: The following episode contains spoilers for Arrow Season 7, Episode 13 titled ‘Star City Slayer’. Do not read if you have not seen the episode or read ahead at your own risk of being spoiled. Arrow has been surprising us some way, some how in every episode this season to date. Those surprises continued in Monday night’s episode, which featured another big reveal and two emotional goodbyes. The episode picks up in the future with 50-years-old-but-hot Dinah, Zoe, Roy, and William going to the old Team Arrow bunker to see if they can uncover where Felicity hid the bombs since they struck out with the Archer system. After arriving at the bunker, Mia and Connor knock them out and start to interrogate them. Mia reveals Felicity is still alive and stop the bombings from happening. She also reveals that William is Felicity’s son (or is it stepson?). Either way, Mia’s toughness did not come across as genuine, maybe by intention. Dinah and Roy escape like the ninjas they are, but Mia gets the upper hand and threatens to kill Dinah. William threatens to shoot her, but Mia says he won’t as her full name is Mia Smoak. That’s right — she’s Oliver and Felicity’s kid. Holy Smoaks! See what I did there? Back in the present day, Rene, Diggle, and Dinah are tracking down the serial killer who sent evil-but-turning-somewhat-good Laurel and Dinah threatening notes. Curtis tracks the drug shipment to the Glades and that is where we find Oliver’s ex-prison friend Stanley. Pause for a moment. Who called that it was Stanley? I think I did! Okay, that’s enough of that. Anyway, Stanley slits Dinah’s throat, but Curtis uses his t-spheres to temporarily heal the wound in order to give Dinah time to get to the hospital. 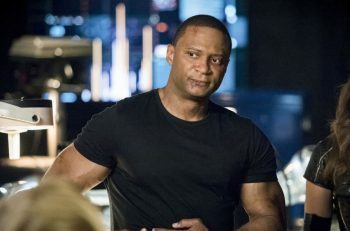 Diggle discovered Stanley’s next target is Oliver. And, while all this was going on, Curtis was considering a job offer from the Kohler Humanitarian Institute in Washington D.C. The other plot of the episode involved Oliver and his family. 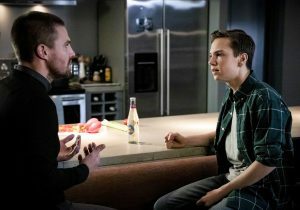 It was weird seeing Oliver away from the Team Arrow action, but I do like how the writers gave him this episode to deal with the drama surrounding his family. William was being extremely difficult in this episode, and honestly, it annoyed me a bit. I understand he is hurting and he wants a normal life. For a kid to constantly wonder about his father and his own safety is never good. But on the other hand, your father is a freaking hero. Be proud of him at least. But no, William goes off on a rant about how Oliver makes poor decisions without taking others feelings into account. Okay, that part may be true. Later on, Samantha’s parents show up and threaten to sue for custody of William, which leads to another screaming match between the two Queen males. The family drama is interrupted when Stanley breaks into the Queen home and drugs them using his paralyzing thingy. Fletcher does a great job portraying a complete nut job and it is scary how good he was. He explains he is targeting both Oliver’s friends and enemies to show he is the only one who understands him. Eventually, the drugs wear off which leads to William and Oliver taking him down using a glass bottle. The ordeal with Stanley makes Oliver realize he needs to let William go so he’ll be safe. We got two goodbyes at the end of the episode. First, William moved to Central City with his grandparents. Hate to break it to ya kid, but the crime in Central City isn’t much better. Curtis also said goodbye at the end of the show, taking the job in Washington. He had a tearful goodbye with Felicity, bringing his journey full circle with the same person he first appeared on screen with. Before departing, Curtis gave her Helix, officially moving Smoak Technologies forward. Captain Singh made an appearance when Dinah called the CCPD for advice on the serial killer and what she should do now that the mayor knows she used to be a vigilante. Am I the only one loving the Batwoman references? Monday’s episode made reference to Arkham Asylum. I’m still shaking over the fact Mia is Olicity’s kid. Arrow returns to The CW with new episodes on March 4.